This entry was posted on December 8, 2014 by Mary Holland. 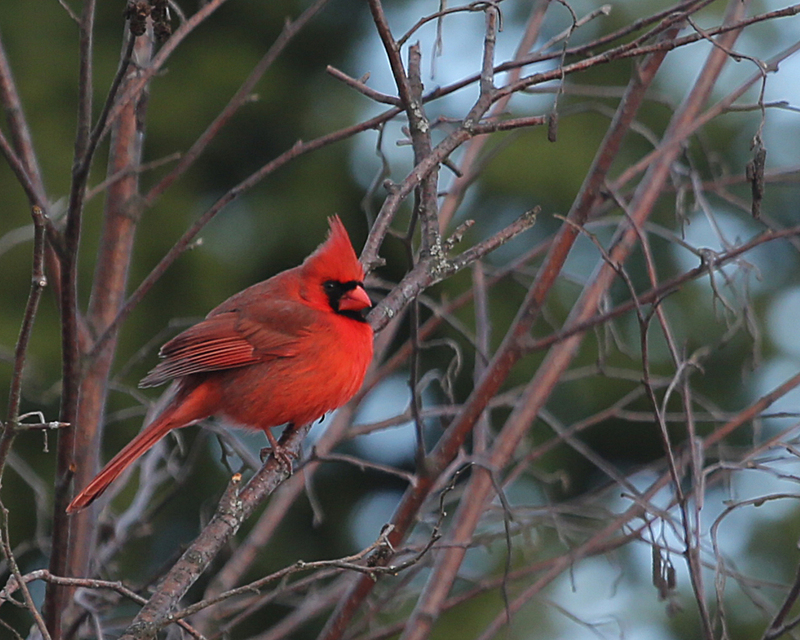 It was filed under Adaptations, Bird Diets, December, Northern Cardinal, Plumage and was tagged with Cardinalis cardinalis. I like to think it’s because they’re trying to brighten up the world. Beautiful photo. It’s always exciting to see bright birds at the feeder! Beautiful capture, Mary. So the color relates to them eating things like rose hips, sumac, etc? Interesting about diet….why aren’t more birds a brilliant red – wouldn’t the Cardinal diet be similar to other birds? Or is the amount that different….? Excellent question, Libby, and one to which I don’t know the answer, but will try to find out! Thanks, Mary! I’ll be so interested to hear…..perhaps the red feather color gene is in place and diet plus health enhance the tone? And I wonder if there is a relationship, as with Blue Jays, to light for our perception of their blue or grey. I’ve watched cardinals feast on the bright red fruit of euonymus, that pesky super invasive landscaping shrub. Can’t fault such a gorgeous bird for aiding and abetting! Similar to pink flamingoes, but I am not sure if it is carotenoids or pink crustaceans, such as shrimp, that affect their pink color. Very astute comment, Gay. I, too, wondered why it would affect one species and not another, but the fact that it does is indisputable…now I just have to find out why!